A rare quiet moment on the market streets of the old town. The decision to make a stop in Sarajevo, Bosnia came as we were planning our routes onward from Croatia. 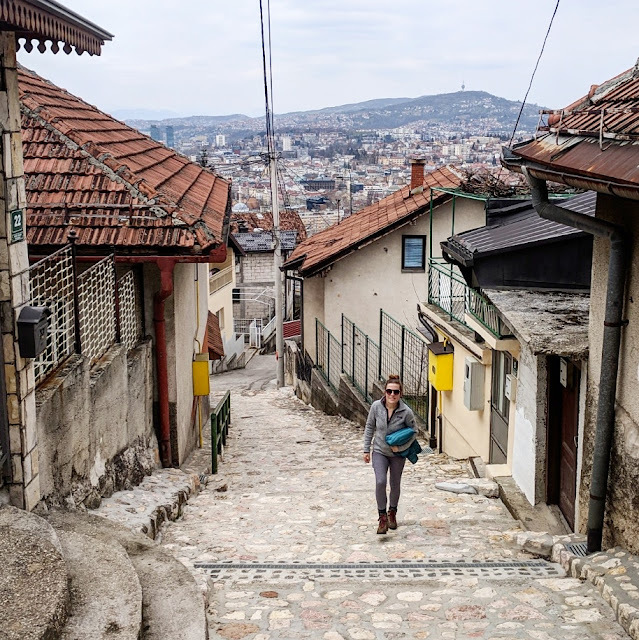 We knew we wanted to end up in Bucharest, but discovered that--besides expensive flights--there was no reasonable way to get there directly from Split or Zadar. (We'd gotten used to the proximity of European countries, and weren't studying the map closely enough to realize how much ground there is between Croatia and Romania. Whoops.) After looking at possible bus routes and their stops across the Balkans, we determined we could slow our roll and take our time getting from the Adriatic coast to "Little Paris." 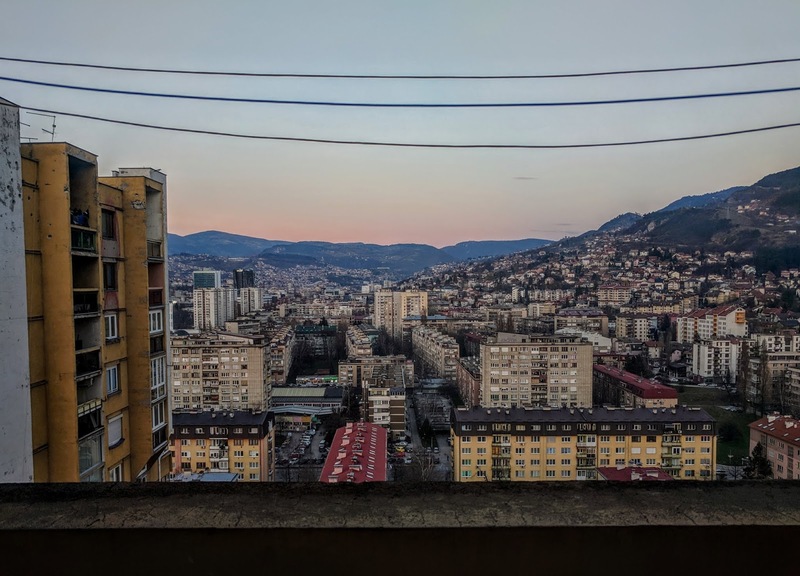 Having been born in the middle of the Bosnian War, I didn't actually know anything of the area at all before arriving besides a vague knowledge of past unrest. 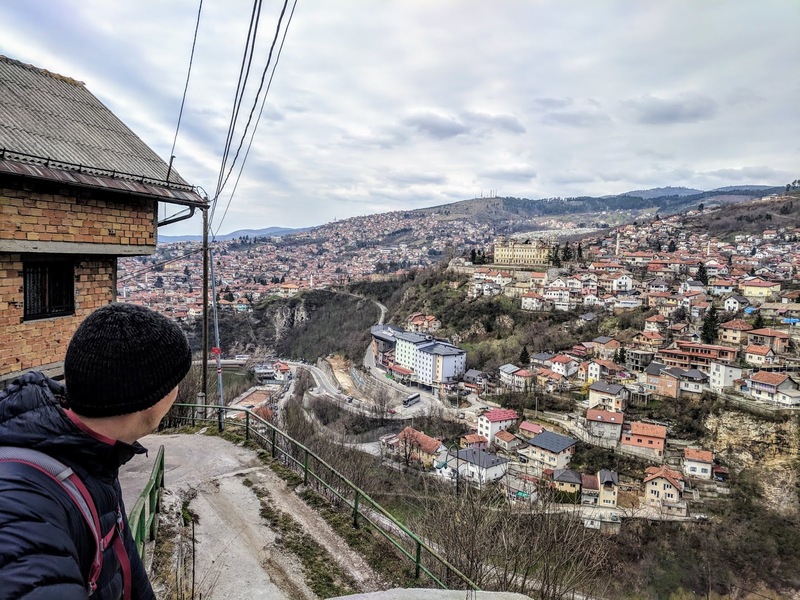 Indeed, we did our due diligence and looked up the travel advisories for both Bosnia and Serbia, and of course found it is a perfectly safe region to visit with a growing tourism industry. The valley provides endless opportunities for views. Since arriving in Sarajevo, I've found myself extremely taken with the city. 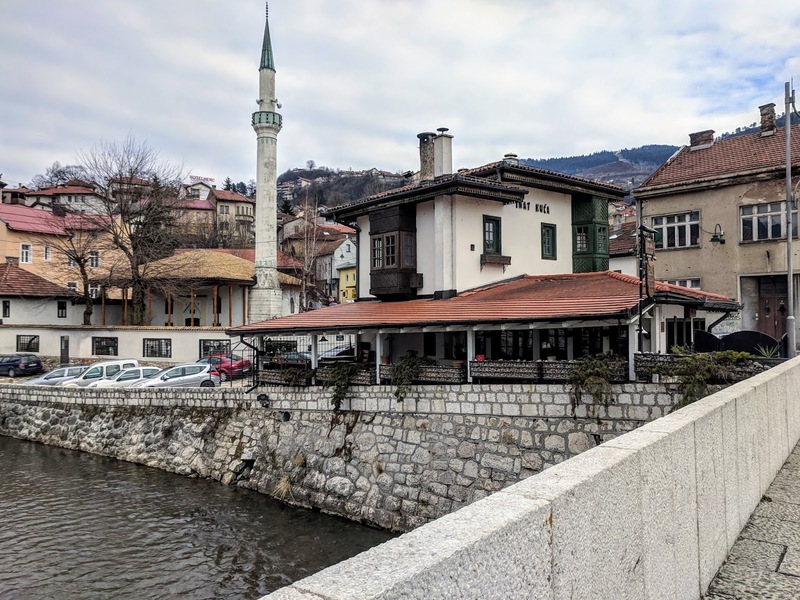 I am blown away by this place's long and rich history--long before the Yugoslav Wars or World War I--and have delighted in discovering such a fascinating and multicultural place. Sarajevo was originally founded in the 15th century by the Ottoman Empire. The Turkish influence is still strong, especially in the old town, which Andrew has also thoroughly enjoyed (he loved his visit to Turkey, and while I haven't been yet, I'm dying to go). The marketplaces and abundance of mosques make it much different here than the European cities we've been to so far. 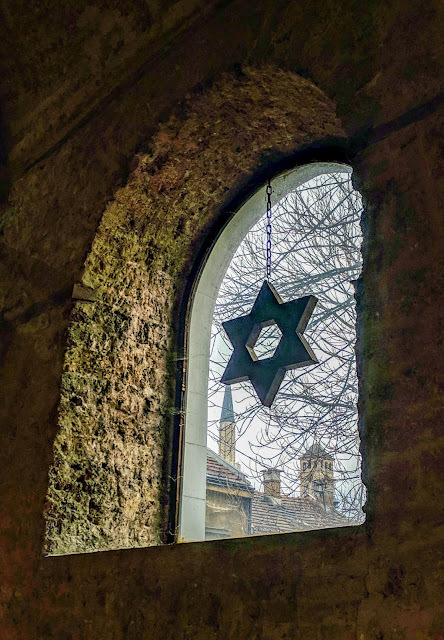 In the 16th century, the Orthodox church and Sephardic Jews arrived; for a very long time, Sarajevo was the only city in Europe to have a mosque, Orthodox church, cathedral, and synagogue in the same neighborhood. This coexistence and multiculturalism is clearly deeply important to Sarajevo. Of course, the violence in recent decades has left deep scars on the city. Intermixed between the glassy, contemporary structures and beautifully ornate historical sites are dwellings left destroyed and abandoned, and even the thriving apartment complexes still bear the marks of mortar shell explosions. We visited the "Tunnel of Hope" museum, located down a residential street near the airport, where you can walk through part of the tiny, crude tunnel hand-dug by the Bosnian military when Serbian forces had completely cut off their resources during the siege. As we hiked up the mountain Trebević (where you can also take a cable car) there were signs every so often reminding explorers to stay on the marked trails, because there once were mine fields in those forests. 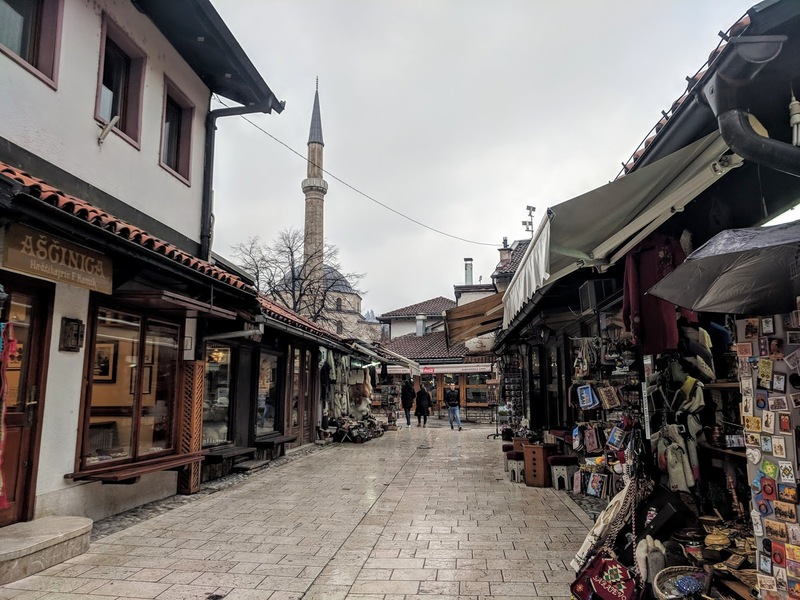 But through everything, the resiliency of Sarajevo and the people of Bosnia is profound, and their friendliness and hospitality has stood out to me. I've never been more struck by the power of human love and cooperation than when we heard the prayers and singing from the surrounding mosques mix with the chiming of church bells. Between the kindness from the woman we met on the bus from Split, to the caring parents of our Airbnb host who helped us do our laundry, I've never felt so taken care of in a foreign city that we're only in for a few days. you can see the nearest mosque and church tower at the same time. And on top of all the history and religion and war and overcoming trauma, the other thing the folks of Sarajevo are brilliant at is food. Everyone we talked to before coming here mentioned the cuisine. Now being the European Capitol of Culture, I suppose that's no surprise. 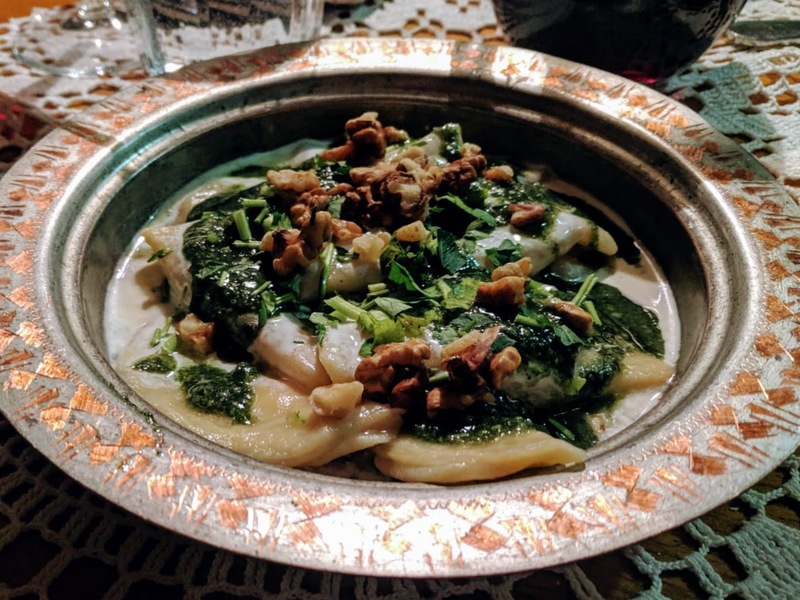 The fantastic mix of Ottoman/Mediterranean/European cooking produces results you can't miss. 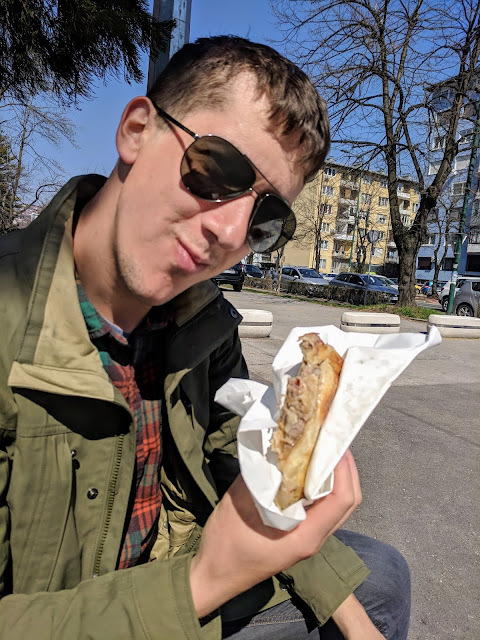 Since most people we know haven't been to Sarajevo yet, but it's steadily growing as a tourist destination, I'm going to entice you with our food experience. 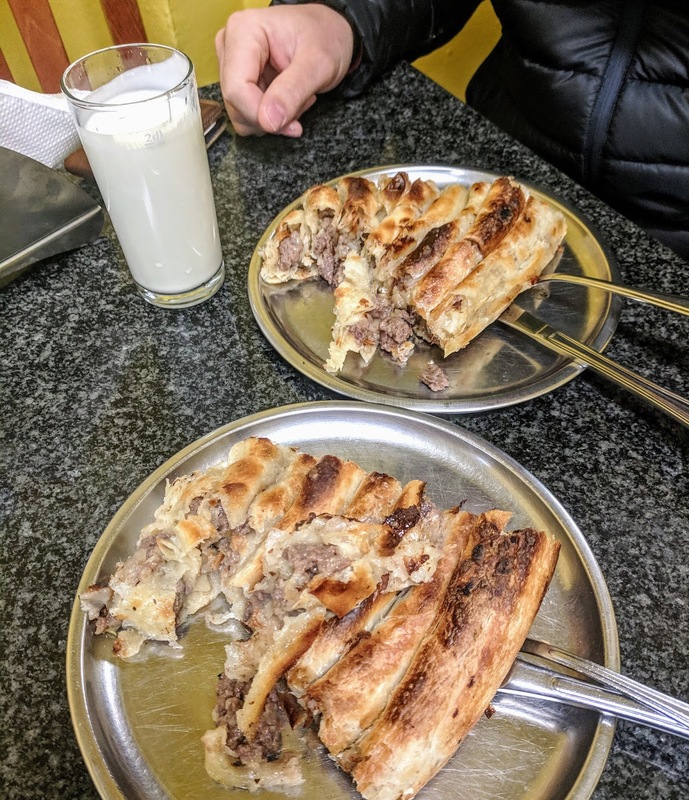 While we tried burek in Croatia, we were told by everybody that we HAD to have it in Bosnia. In Croatia, it's a savory treat of meat or cheese wrapped in flaky pastry dough, and sits in a little coil. In Bosnia, they take burek to the next level--the coils are wound into a massive "pie," and the pan is cooked on a bed of coals. You are served a sliced wedge, and can get it with tender minced meat (with amazing seasoning and often onion), cheese, or potatoes. We tried burek for our first lunch in Sarajevo, from a little shop near the city center called Buregdžinica Žigo. It was very small, packed with locals either eating a quick bite or taking theirs to go. I'm not a big yogurt person these days, but Andrew is, and he ordered the traditional yogurt drink to go with it. The burek was amazing. We both got ours with meat, and we had to wait a minute for it to come out, so it was beautifully fresh and incredibly delicious. Greasy, flaky, tender, and seasoned to perfection. On our last day in the city, we went for burek again, but this time without looking up where to go ahead of time. We took a risk and got some to-go at a stand near our bus stop. Andrew chose the meat version again, but I tried it with potatoes. We were delighted to find it was just as good here; the portions were smaller (which was ok) but our lunch cost 3 km--about $1.73. On our bus into Sarajevo from Split, we met a delightful Bosnian woman who gave us lots of helpful tips about enjoying the city, and she kept talking about the delicious cakes. She recommended we go to a place called Ramis in the old town, near the Gazi Husrev-beg Mosque. It was a beautiful little patisserie, and we had the worst time trying to decide which little cakes and desserts to try. 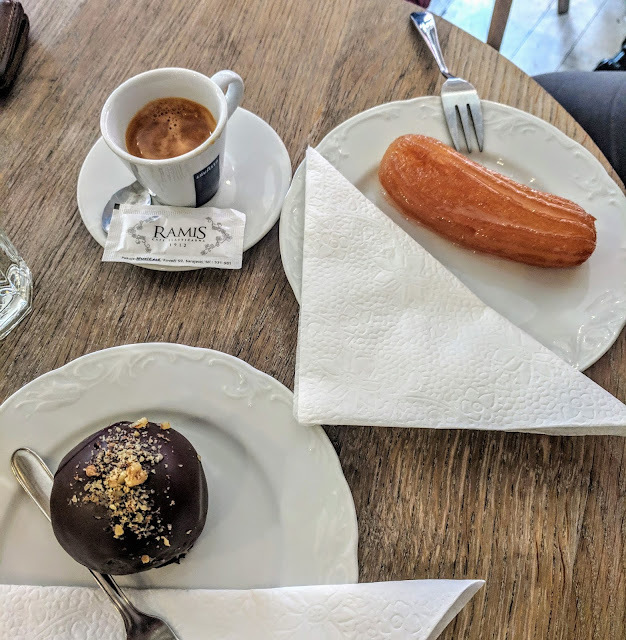 I ended up with a ball of chocolate cake and walnuts, and Andrew ordered what seemed to be a churro-style pastry swimming in honey and syrup. 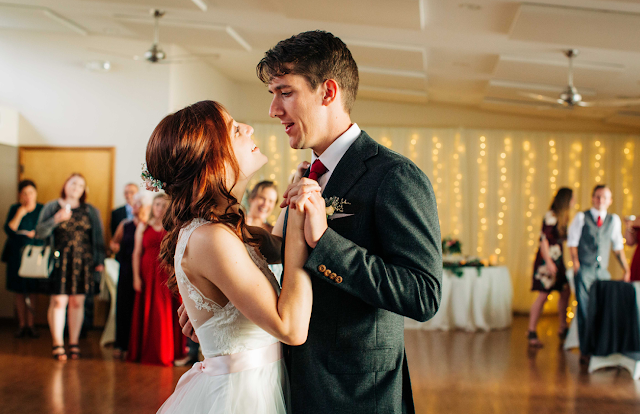 Both were fantastic, and somehow different than other desserts we'd ever had, but that was about all the sugar we could handle that day! 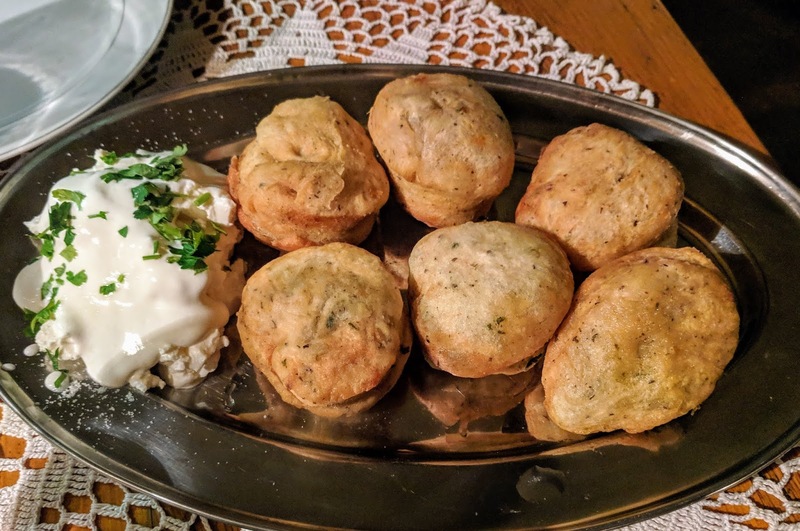 We were feeling the pressure to find a really good restaurant with traditional Bosnian cuisine, so we could feel like we'd gotten the most out of our measly 4 nights in this country. Some extensive research lead us to Žara iz Duvara, or "The Singing Nettle." We would have never found this place just wandering around, as it's small and on a darker and heavily-graffitied street just a block or two from the main drag, but we had the best time. It's a little old-fashioned place that seems to be run just by the two owners; the gentleman serves out front, and the lovely lady works her magic in the kitchen. For our main course, we'd ordered a house special with an assortment of Bosnian meats and vegetables. 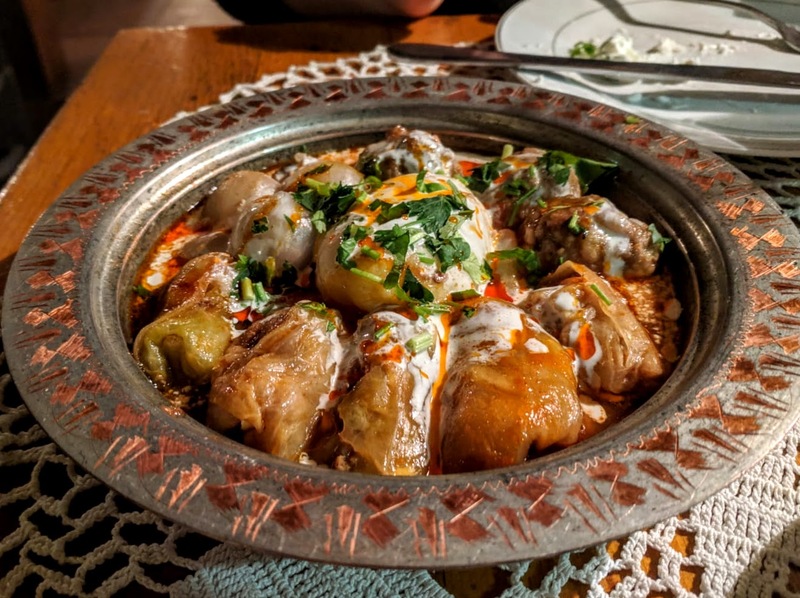 It included dolma, stuffed vegetables (eggplant, peppers, onion); sarma, which are cabbage leaves stuffed with veal and rice; the most tender and flavorful meatballs you'll ever eat; and a beautiful potato right in the middle. The Bosnians love everything with sour cream. Our second house special was homestyle ravioli stuffed with cottage cheese, in a nettle pesto with walnuts. The dishes came in ornate lidded bowls, and it almost seemed wrong to ruin the presentation by devouring them... But devour them we did. And it was sooooo good. 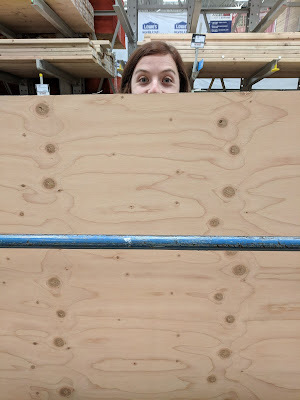 Neither of us are food bloggers, so we don't even know what words to say to describe this experience--I just know my brain was lighting up with aalllll the dopamine! Life-changing homestyle ravioli in nettle pesto. Nettle pesto! Though we were absolutely stuffed, we'd enjoyed our first two courses so much we couldn't skip dessert from this place. We went for the "apple pie," curious about Bosnia's interpretation of one of America's favorites. 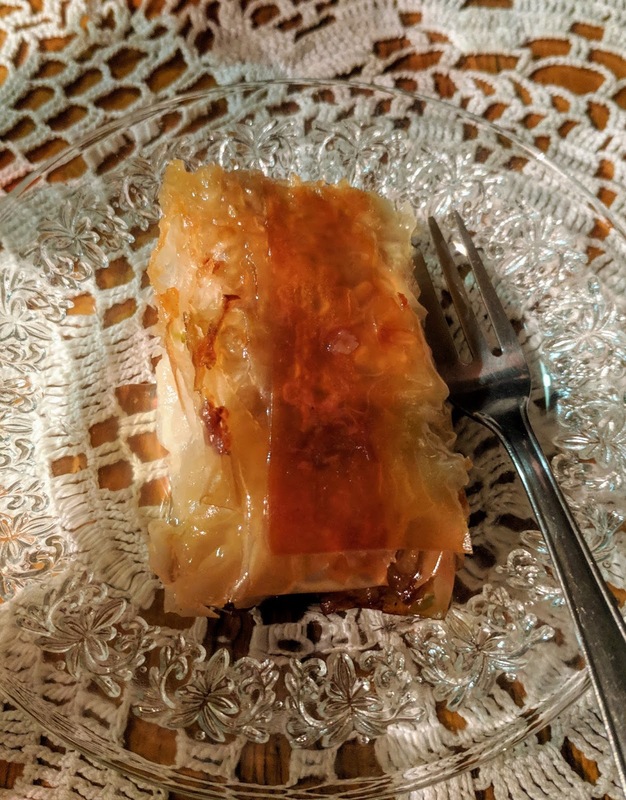 It would describe it as a kind of apple baklava, meaning it was layers of flaky pastry dough with an apple purée and in a sweet glaze. It was, of course, divine. Even more than the burek, we were told we had to try ćevapi. 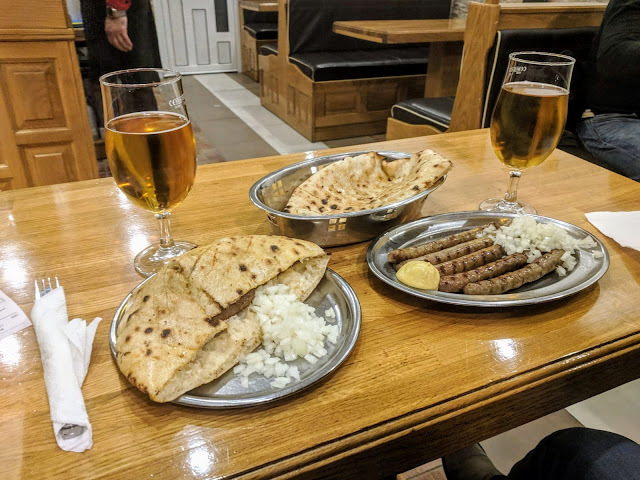 It's a traditional Bosnian/Balkan meal, but Sarajevo in particular is famous for it. It is available everywhere it seems; we saw signs for it all over the place, but wanted to be sure we got the good stuff. We were recommended two places: Mrkva in the old town close to city hall, and Ćevabdžinica "Zmaj" near our apartment. In the end, we were already running out of time to try this famous and beloved dish, so on our last night we walked about 15 minutes to the latter one. Ćevapi essentially consists of what look like breakfast sausages in a kind of pita bread with diced raw onions. I'm fairly sure one is supposed to eat it with sour cream, as well. The bread also isn't true pita bread, though the Bosnians supposedly make that too. When our heaping plates arrived--we also ordered some different kind of sausage--we had no idea how we were supposed to proceed in eating this meal, so we side-eyed the family next to us. They were just going at it with a combo of hands and forks, so we followed their lead. It was a few minutes later that we noticed there was a small sink in the corner of the restaurant, separate from the bathroom sinks, that guests were frequenting. The plate on the left is classic ćevapi, but we also got other sausages and a slightly different pita bread. So we messily ate our sausages and ćevapi and drank Sarajevo beer to wash it down. I can't say I was as blown away or enchanted as with our "homestyle" dinner, but I understand this was a local staple and traditional throughout the entire region, and the sausages were far more tender and flavorful than any I've had at home. No regrets. If you get the opportunity and privilege to visit Sarajevo sometime, learn from our mistake and give yourself more than just 3 full days to soak in this incredible place. Hike up the steep and winding streets to the White Fortress, wander through the Ottoman-style markets, and visit the museums. Enjoy the shopping along Maršala Tita where the old buildings are tall and the street very busy. Take a cable car to the top of the mountain and enjoy the views. Soak in the energy of the religious diversity. You'll also have to try the things we didn't have time for: Bosnian coffee, a stew called "Bosnian pot," any authentic Turkish food or tea, etc. The "Jerusalem of Europe" is absolutely worth visiting, and I know I only scratched the surface of what I could learn from Sarajevo. the river. Now it stands as a symbol of Bosnian stubbornness and pride, and serves local cuisine. Dusk from our Airbnb balcony. Climbing (literally) the streets towards the mountain hike.